Sober Look: Who really benefits from the weak euro? Who really benefits from the weak euro? Analysts often talk about how the weak euro helps exporters in the Eurozone, particularly Germany because of its massive export sector. But is Germany the main beneficiary? Which other nations want the euro to weaken further? BNP Paribas did some helpful analysis on the subject. First of all it's not enough to be an exporter to benefit from the weak euro. A nation needs to be exporting outside of the Eurozone. 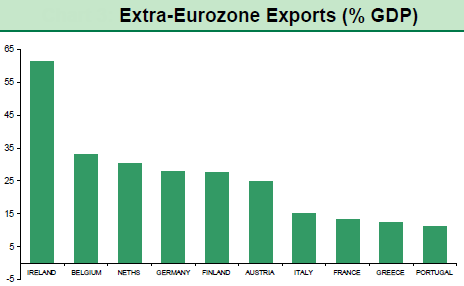 The first chart shows who the largest "extra-Eurozone" exporters are as a percent of their total exports. Finland is at the top with close to 70% of its exports going outside of the euro area. But now one needs to ask if Finland's export sector is a major portion of its GDP. 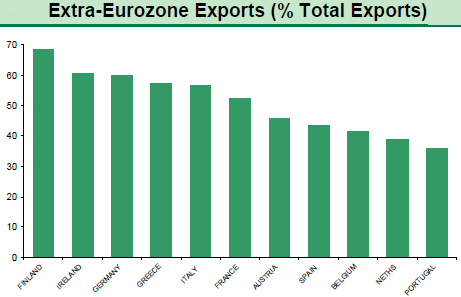 The next chart shows exports as percentage of GDP for the major Eurozone members. Finland it turns out has significant domestic demand to make its export sector an important but not a critical component of the GDP. Ireland and Belgium are now at the top. In fact nearly all of Ireland's GDP comes from net exports, offsetting ongoing declines in domestic demand. 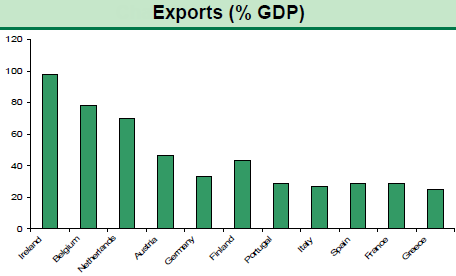 So the final question is what happens when we look at "extra-Eurozone" exports as a percentage of countries' GDP? That should tell us which nations' economies benefit the most from the weaker euro. 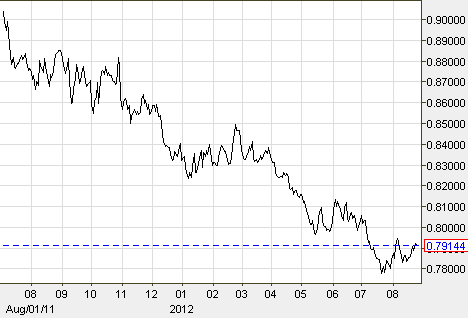 From this we see that Ireland is by far the largest beneficiary of euro's correction. That explains in part why Ireland has been able to buck the trend of Eurozone's recession, expanding its manufacturing base while others in the Eurozone have been undergoing a contraction (discussed here). 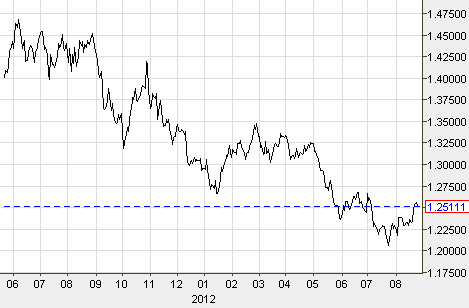 Of course it also makes Ireland highly vulnerable to a euro rally. And the euro came to life this month, driven in part by Draghi's promises to "save" the currency as well as a partial reversal of massive speculative short positions (discussed here). In particular the EUR-GBP level becomes critical for Ireland, given the nation's large exports to the UK and the UK's difficulties in shaking off its recession (discussed here). In fact Ireland's exports to the UK may have slowed down in Q2, making the currency level even more critical. Irish Times: - The figures show that one in five principal freight segments had growth over the second quarter, while all other segments declined compared to the same period last year. In the first half of 2012, exports declined by 2 per cent, while imports fell by 4 per cent. Roll-on/roll-off traffic declined in the Republic by 4 per cent in the second quarter. The majority of Ro/Ro freight from Ireland is destined for Britain. The British economy contracted between April and June with marked declines in its construction and manufacturing sectors. The Eurozone nations are impacted quite differently by the fluctuations in the euro. Ireland benefits the most from the weaker euro - far more than Germany as a percentage of its GDP. Because of euro's weakness it was the only Eurozone nation that saw its manufacturing markedly improve recently. But this also makes Ireland vulnerable to EUR appreciation, particularly against GBP.